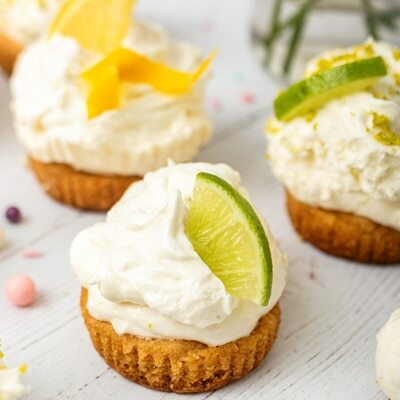 These cute Mini Lemon Lime Tartlets give the fresh taste of spring and are the perfect way to celebrate any occasion. PREHEAT oven to 325º F. Paper-line 24 muffin cups. CUT dough along pre-scored lines; place one piece of cookie dough in each muffin cup. BAKE for 13 to 15 minutes or until golden brown. Cookies will be puffy. Cool completely in pan on wire rack. BEAT sweetened condensed milk and cream cheese in large mixer bowl until smooth. Gently fold in whipped topping. Divide mixture into two medium bowls. Stir lemon juice and lemon peel into one bowl and lime juice and lime peel into other bowl. POUR about 3 tablespoons lemon cream cheese mixture, followed by the lime cream cheese mixture, over 24 cookie cups. Refrigerate for 2 hours or overnight. Decorate with lemon and lime quarter slices, curls or peel, if desired. •	Using low and reduced fat cream cheese and whipped topping helps to make these treats lower in fat. •	Love lemon but not crazy about lime? Simply double the lemon juice and grated lemon peel in the recipe and leave out the lime, and make 24 lemon tartlets. Tartlets may be frozen in an airtight container for up to 2 weeks. Allow to thaw at room temperature for 30 minutes before serving.